Hot Cross Buns for Easter. Great party. Thanks for hosting. We’re havng a Monday party – Wha’d You Do This Weekend. Goes live at midnight. Hope you can drop by. Happy Sunday. We linked up two great recipes this week. Hope you like them. Thanks so much for the party! I wish you a great week! Thanks so much for hosting 🙂 Everything looks so delicious. I’ll be making the rounds! Thanks for the feature! Look forward to your great party with great recipes and beautiful photos each week! 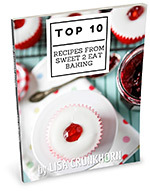 Thank you so much for including my Rhubarb Shortcakes in your features, Lisa! Hope you’re having a great week! Oh and by the way, how can one become a co-host and what are the requirements? Would love to be one once 😀 Take care! Another great party with tons of delicious inspiration!